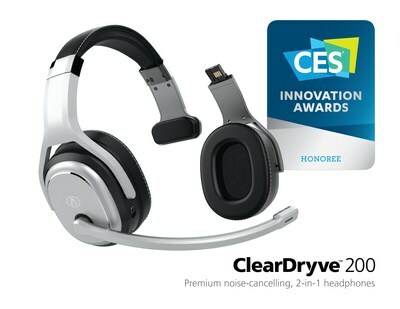 NEW YORK, Nov. 8, 2018 /PRNewswire/ -- After reviewing hundreds of new high-tech products and services, the Consumer Technology Association (CTA)™ tonight named Rand McNally's ClearDryve™ 200 a 2019 Innovation Award Honoree in the highly competitive "Headphones" category. Built for professional drivers, ClearDryve™ 200 is a premium 2-in-1 noise-cancelling headphone pair that converts into a mono headset. Innovation Award recognition is given to an elite group of products that have scored highly across a variety of criteria that reflect outstanding product design and engineering. Products reviewed in the prestigious CTA program are judged by a preeminent panel of highly respected consumer technology designers, engineers, and tech journalists. Entries are evaluated based on their engineering, design, functionality, consumer appeal and how they compare to competitors in the marketplace. ClearDryve™ 200 was recognized for its crystal clear sound, superior noise-cancellation, and switchable all-day over-the-ear comfort. "This honor exemplifies Rand McNally's commitment to creating innovative, high-end tools for professional and everyday drivers," said Stephen Fletcher, CEO of Rand McNally. "We are pleased to be one of the few companies publicly recognized by industry peers for our first-ever headphone product. We will continue to focus on the headphone and headset product line, going beyond the limitations of existing items in the market." Unique to the professional driving market, ClearDryve™ 200 is flexible, providing drivers with a hard-working headset for making and receiving calls while on the road, and an ultra-high-fidelity pair of headphones for relaxing after the day's drive. Rand McNally worked closely with its professional driver customer base in developing ClearDryve™ 200. The CES Innovation Awards are sponsored by the CTA, which hosts the global Consumer Electronics Show each year in Las Vegas. The group has recognized achievements in product design and engineering for more than 50 years. Rand McNally's ClearDryve™ 200 will be showcased during CES Unveiled New York and CES 2019, in Las Vegas, January 8-11, 2019. ©2018 RM Acquisition, LLC d/b/a Rand McNally. All rights reserved. Rand McNally, the globe logo, and ClearDryve are trademarks of RM Acquisition, LLC d/b/a Rand McNally. About CES – CES® is the world's gathering place for all who thrive on the business of consumer technologies. It has served as the proving ground for innovators and breakthrough technologies for 50 years-the global stage where next-generation innovations are introduced to the marketplace. As the largest hands-on event of its kind, CES features all aspects of the industry. Owned and produced by the Consumer Technology Association (CTA)™, it attracts the world's business leaders and pioneering thinkers. Check out CES video highlights. Follow CES online at CES.tech and on social media. About Consumer Technology Association – Consumer Technology Association (CTA)™ is the trade association representing the $377 billion U.S. consumer technology industry, which supports more than 15 million U.S. jobs. More than 2,200 companies – 80 percent are small businesses and startups; others are among the world's best-known brands – enjoy the benefits of CTA membership including policy advocacy, market research, technical education, industry promotion, standards development and the fostering of business and strategic relationships. CTA also owns and produces CES® – the world's gathering place for all who thrive on the business of consumer technologies. Profits from CES are reinvested into CTA's industry services.